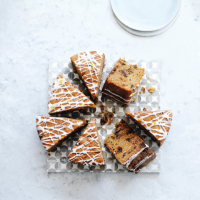 This dairy-free orange drizzle cake contains a hint of spice, fudgy dates and ground almonds, which make it deliciously moist – perfect with a cuppa or to round off a meal. loose bottomed cake tin with baking paper. 2. Set aside 2 tsp orange juice and a little of the zest then place the rest in a small saucepan with the dates and heat together for 2-3 minutes. Remove from the heat and leave to cool. 3. Using an electric hand whisk, beat together the Flora and light muscovado sugar in a bowl for 3-4 minutes until pale and creamy, then beat in the eggs, one at a time (add a tablespoon of flour if the mixture looks like it may curdle). Fold in the remaining flour, bicarbonate soda, cardamom seeds (discard the pods), ground almonds and a pinch of salt. 4. Stir in the cooled dates and juice and spoon the mixture into the prepared tin. Level the surface and bake for 1 hour 20 minutes until a skewer inserted into the centre comes out clean. Cool in the tin for 30 minutes, then take out and cool on a wire rack. 5. When the cake has cooled completely, mix the reserved orange juice and zest into the icing sugar. Drizzle over the cake and serve.